ew ew ew ew ew ew ew ew ew ew!!!! eating a giant bees is grosser than words can describe!!! :P I'm allergic to bees so I'm especially grossed out!!! 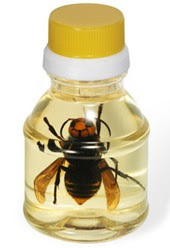 I'd actually be willing to try the hornet honey. But I'm of two minds about the MeatWater. It could be good, maybe even revolutionary, for people on clear fluid diets. On the other hand, dirty hot dog as a flavour and a soft drink tasting like GOULASH... that's just gross. The first one looks like vitamin water. Weird. Ew! That Vitamin Water looking stuff (which I have named Meatamin) is in my eyes the equvilent of meat paste (which I hate)! Gross but likeable. Why do all 'speacial drinks' look like each other. I have seen a couple of drinks that have the same look( the label) if you know what I mean. Do they sell veggie water? I agree with Spring. It does look like vitamin water. um wouldnt the meat water be like beef broth???? Woah, i wonder what you'd do if u were vegan?? 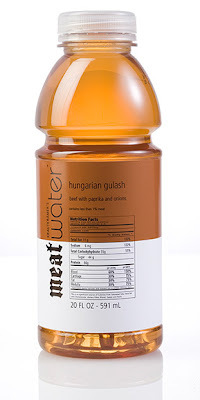 what kind of genius would think of meat water...seriously! but cool post! Oh my gosh! It's the same design of VitaminWater! Maybe it's supposed to be broth to be heated up. And the bees!!!!!! That is horrible!